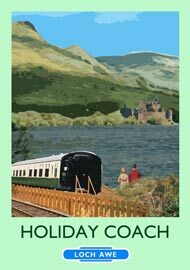 "The one train you won't miss until you leave"
"The most wonderful and memorable family holiday." "Best holiday I've had. Even better than Mallorca." "Excellent in every way. Fantastic week." "Staying at the carriage was a 60th birthday treat from my wife. It's been the most fantastic experience." Steve - Birmingham. 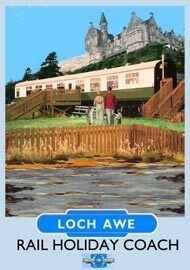 "Did all our excursions by rail and bus: Loch Lomond, Mallaig, Oban & Tobermory." Peter and Diana - Halesworth. "The boys thought it was very exciting, especially when the trains went by and the drivers tooted." Cranston family - Braco. "Wonderful week - Magical. No superlatives would exaggerate. Every time we looked out of the window, the light had changed the scene. Never the same view twice. Best equipped self-catering accommodation we have ever stayed in And we're 84 & 80. 5 star comfort beds. We go home renewed." Francis and Jo. - Norwich. "Some of the best living room views in Britain. Our train mad 6 year old spent the week checking our tickets, waving flags and blowing his whistle at every passing train." Flintham family - London. "A wonderful concept. We enjoyed being the 'Railway Children'. Great fun!" "Both comfortable and peaceful. A perfect place for a lovely holiday." Nick and Lucy - Peterborough. "A fantastic place to stay with stunning views. One week not long enough."